Level measurement presents particular technical challenges for cement works. The properties of the material are the cause of significant dust formation and caking under damp conditions. MBA Instruments has now introduced the maintenance-free MBA800 rotating paddle series for demanding applications; the device always delivers reliable measurement results, no matter how difficult the conditions. Instead of a conventional synchronous motor, the MBA800 has a digital stepper motor. Because of the way it is constructed, the complete MBA800 series operates without wear and therefore does not require maintenance. In combination with the rotating paddle measuring method, which has been tried and tested over many decades, the stepper motor offers a range of advantages and additional versatility for users. The rotor of the motor, a rotating permanent magnet with shaft, is continuously rotated around a minimal angle by the electronically controlled, gradually revolving electromagnetic field of the stator windings (the non-rotating part of the motor). Power transmission thereby takes place via magnetic coils without contact, making retracting springs and mechanical switches unnecessary. With no moving parts inside the device head, the MBA800 models work with great sensitivity according to a principle that is just as simple as it is reliable: they rotate, effect constant measurement, and react, when necessary, with changes in the direction of rotation. The device can be set to low torque for higher sensitivity; this facilitates the universal deployment of the device in all kinds of bulk material. The use of a stepper motor results in several metrological advantages in comparison to the conventional motor. Parameters such as rotation speed, changes in the direction of rotation, signal tripping time and idle periods can be set easily using selectable, pre-defined parameter combinations, which impress with their clarity and easy-of-use. The torque can be set separately to adjust the sensitivity of the measuring device to all types of bulk material. The compact plug-and-play MBA888 model even goes one step further: all parameters are pre-set to fixed values and optimally calibrated – making the device ideal for a swift initial start-up. There is a choice of only three different shaft lengths, and these are connected with the welded mini-paddle. The small device head, which fits into narrow spaces, delivers a high level of flexibility. The housing of the device is completely sealed, and the connecting cable and signal cable are connected to the device by means of an M12 plug. Thanks to this universal solution, users no longer need to seek special metrological solutions for different types of bulk material, and they can reduce installation and start-up times. Once in day-to-day use, the various models in the MBA800 rotating paddle series take care of the additional challenges that can lead to disruptions in production processes when using conventional devices. Thanks to their robust design, the measuring systems are impervious to significant dust formation and can even withstand strong turbulence when filling air and material at the same time. Conventional devices often cause problems under such conditions, and they can respond to strong vibrations by issuing fault notifications or even switching themselves off. Users of the MBA800 models benefit from the additional jolt and vibration testing the devices undergo at 29 g.
Since inadequate explosion protection systems in silos and other contained facilities can lead to serious consequential damage, it is important to give just as much consideration to safety in measuring processes as to the reliability of the measurement technology. The characteristics of the specific bulk material are just as important in a risk assessment as the structural conditions and possible sources of ignition. The ATEX directives serve as a reference framework for all safety issues, and the devices are made and certified in accordance with these standards. With the type examination having been carried out at the beginning of 2016, the MBA800 rotating paddle has now been officially approved for use in hazardous dust areas. 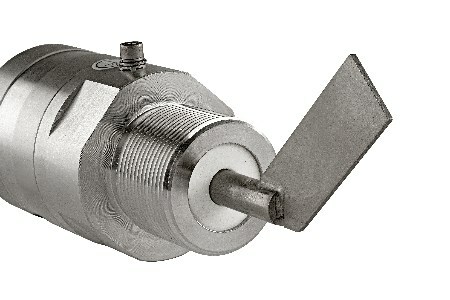 The bulk level indicators of this series are suited to the 2D equipment category (Zone 21). The shaft of the level indicator, which is driven by an integrated stepper motor, belongs to equipment category 1D and can therefore be used in Zone 20 – provided the devices are mounted into a suitable partition using the process connection so that the installation provides a zone separation. The plug-and-play model MBA888 has a fixed connecting cable and a housing that is available in either aluminium or stainless steel. The cover housing and shaft housing, meanwhile, are inextricably connected to each other. The standard mini-blade is already welded on the motor shaft, which is available in various lengths. Furthermore, the MBA888 is available in a short (24 VDC) and a long (115V-230 VAC) variant. Like all the other equipment in the series, the MBA888 complies with the latest EN 60079-0:2012 + A11:2013 standards, as well as the EN 60079-31:2014. They are therefore optimally suited for use in the explosive bulk materials segment. Article provided by MBA Instruments.